The thermostat that is. Every degree lower at night or when you are away can add up to significant savings over the course of a winter. 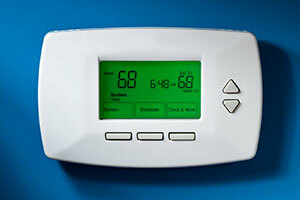 A programmable thermostat will allow you to set it and forget it. A reminder: During severe single digit cold weather, turn your thermostat up a few degrees to ensure that your pipes do not freeze. I know it’s here somewhere. Check for lost heat. Close your fireplace damper when not in use. Do not run exhaust fans any longer than necessary. Check to ensure your home exterior is properly caulked around windows, doors and fireplaces. Be sure you have an adequate blanket of insulation in your attic. Install energy efficient windows to keep heat in during the winter and heat out in the summer. Air flow that is. Be sure all duct work, baseboard and radiators are clean and unobstructed. Heated air needs to be able to circulate. Vacuum your baseboard fins and make sure carpeting does not block air flow underneath. Be sure your baseboards and radiators are not blocked by furniture or drapes which can trap heat. If your equipment is 20 or more years old you have the opportunity to upgrade to a state of the art, clean burning, and energy efficient heating system. New equipment can reduce your oil consumption by as much as 30%, a savings payback on your investment that will beat the return of any bank or stock. You’ll also enjoy the extra dividends of plentiful hot water, reliable warmth and increased home value. Now is a great time to get a great price on a new Burnham boiler or Reillo burner. Special terms are available for a limited time to make a great deal even better. Call today or contact us to set up an evaluation by one of our trained sales representatives.